Dr. Andrea Walker graduated from the University of Dundee in 2005. After vocational training in Elgin and hospital jobs in Leeds, Bristol and Melbourne, Australia she settled in Inverness in 2009. She completed the diploma of Membership of the Faculty of Dental Surgery of the Royal College of Surgeons of Edinburgh in 2007. 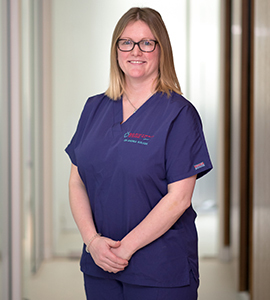 Andrea’s main interest in dentistry has always been oral surgery and she has been working as a Specialty Doctor in the Oral Surgery Department at Raigmore Hospital for the past 8 years. She also currently works within the Public Dental Service in Inverness. She undertook an MSc with the University of Glasgow in Primary Dental Care with a specialist interest in oral surgery which she passed with merit in 2014.